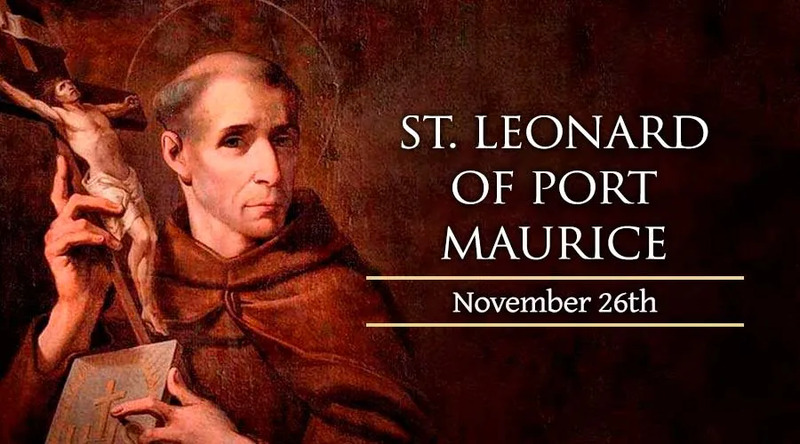 St. Leonard was born on December 20, 1676 in Porto Maurizio, Italy. He was given the name Paul Jerome Casanova by his father Domenico Casanova, a sea captain, and his mother, Anna Maria Benza. When he was 13, he was placed with his uncle Agostino to study for a career as a physician, but when the boy decided against medicine, his uncle disowned him. He then began to study at the Jesuit College in Rome. On October 2, 1697, he joined the Franciscans of the Strict Observance and took the name Brother Leonard. He was ordained in Rome in 1703. He taught for a while, and expected to become a missionary in China, but a bleeding ulcer kept him in his native Porto Maurizio for the several years it took for him to recover and regain his strength. In 1709, he was sent to Florence where he preached in the city and nearby region. A great preacher, he was often invited to visit and preach in other areas. He worked to increase devotion to the Blessed Sacrament, Sacred Heart, Immaculate Conception, and the Stations of the Cross. One of his accomplishments was to set up the Stations of the Cross in over 500 different places, including the Colosseum. He was sent as a missionary to Corsica by Pope Benedict XIV in 1744 and restored discipline to the holy orders there, but local politics greatly limited his success in preaching. He returned to Rome exhausted, where he spent the rest of his days. He died on November 26, 1751 at the monastery of Saint Bonaventure in Rome.